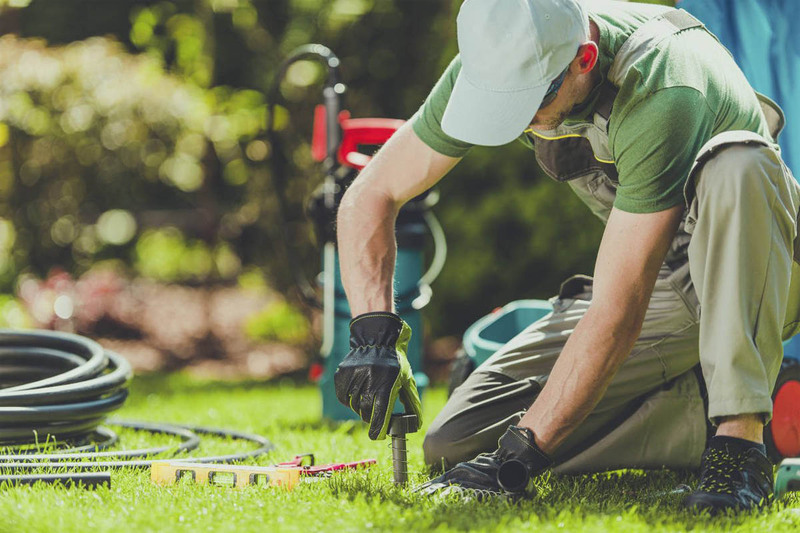 Whether you are homeowner or business in the Tampa Bay area, proper irrigation is crucial to keeping your lawn looking lush and green. 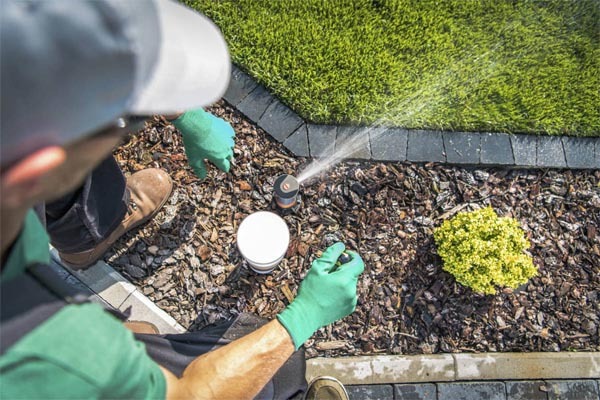 When it comes to irrigation and sprinkler systems, it’s all about striking a balance between conservation and allowing sufficient water for healthy plant growth. Too little water and you’ll be left with a lawn that’s a patchy brown eyesore. 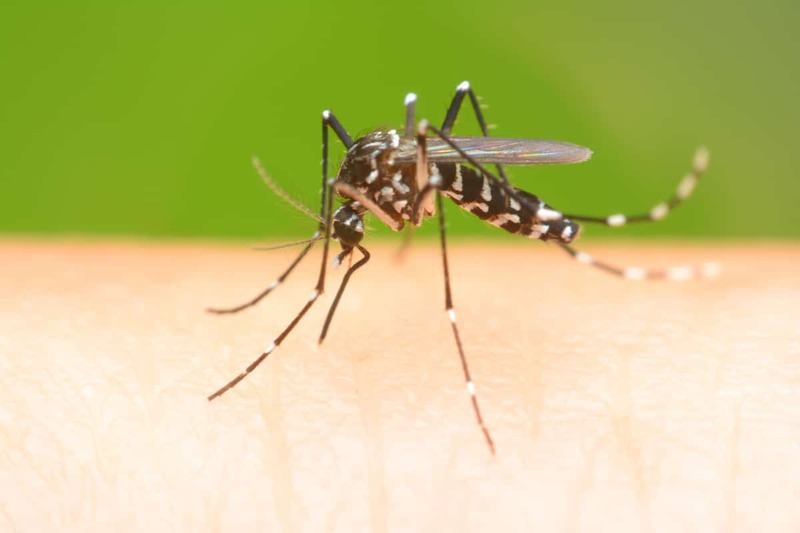 Too much and you’ll be wasting water (and money) and possibly even drowning your greenery. At Sunrise Irrigation, we believe that beautiful properties begin with a healthy, green, and thriving lawn. 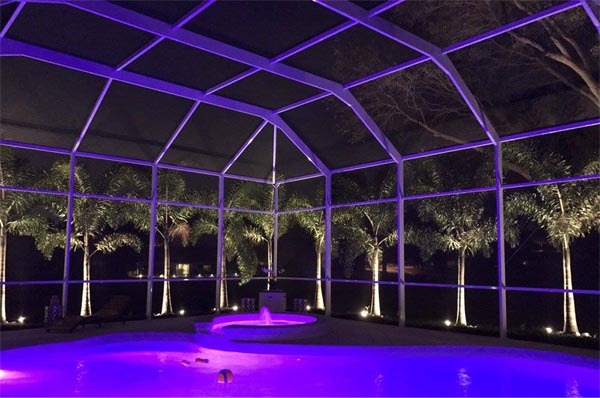 Proudly serving residential and commercial customers in Tampa Bay for more than 20 years. 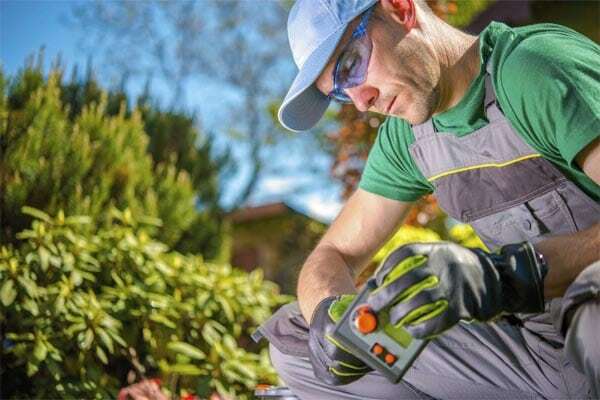 We’ve been able to gain the trust of the local community by using a team of top irrigation specialists, all of whom are dedicated to providing unparalleled lawn and irrigation services. 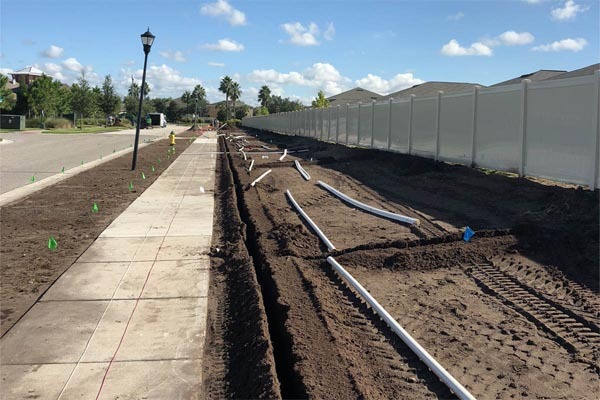 Throughout Tampa Bay, the Sunrise Irrigation name has become synonymous with flourishing lawns and smart water conservation. Our irrigation experts have the expertise, resources, and experience to accommodate all of your irrigation needs. We utilize efficient systems that are designed to conserve water, save you money, and provide you with smooth, stress-free operation for many years to come. 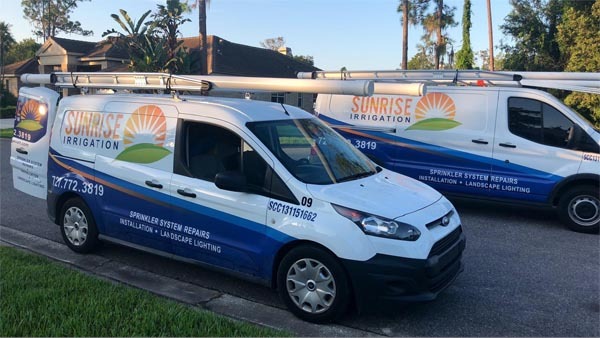 If you are looking for an honest, experienced, and dependable company to install, repair, or maintain your sprinkler and water systems in the Tampa Bay area, give us a call today. Prompt, couteous, knowledgeable and not only kept the appointment but confirmed the appointment the day before. I have said many times one of the things that sets you apart from other similar companies is customer service. Mike from Sunrise was all these things. Very appreciative of the work he did..still trying to figure out what’s going on but he improved my sprinkler 100% over what it was. And Ashley in the office was great to deal with.. excellent customer service representative. Thanks again. Throughout the last 6 years we have invested well above $3,000 trying to get our sprinkler/irrigation system up to par to keep our lawn lovely and green. Until seeing a Sunrise Irragation employee across the street at which time he was nice to give me a company card. I called the very next day and scheduled an appt and ask that they send the same employee I had spoken to prior. My appt was for the 29th of May but luckily someone postponed and I got to take their place. Sunrise sent Mike Green to find the problem and he gave us his word that he would have our system up and running correctly and proficiently before he left. Two and a half hours later after replacing 1 bad valve and fixing 2 others, installing 2 new heads, capping 1 head, and repairing 2 valves that were stuck in the on position, it was like a magic wand had been waved over our property. Extremely good pressure in all 6 zones. My wife and I have nothing but praise for the dedicated, hard, professional work of Mr. Mike Green and commend Sunrise Irragation and would recommend their high quality work at fair/reasonable rates to anyone wanting the job done right the 1st time. First class all the way. They worked me into what I know is a very tough schedule for them. Kyle arrived exactly on time and went to work immediately. He certainly knew what to do and he did it. He’s a good guy and went the extra measure to solve our problem. Though he was very friendly he did not stand around and socialize, he just did his job and very well I should say. Sunrise prices seemed just a tiny bit high BUT you can call them once or you can call others repeatedly. You get what you pay for. I will call them for future repairs and can heartily recommend Sunrise and Kyle to anyone. Paul, from Sunrise called and came an hour earlier than planned. It took him 30 minutes to assess the situation and within that time he had to rewire the connections. Paul put in new piping, new sprinkler heads and buried the pipe much deeper than it was previously. He did an excellent job and knew exactly what the problem was and tackled it. I had used another company 3 times and they left me with a pipe sticking out of the ground and a huge bill. This company is excellent and would Highly recommend. . . .they know what they are doing!!. I had tried 4-5 different irrigation/sprinkler companies before I called Sunrise Irrigation. Each time I ended up having to call them back to fix something they missed or they showed up late or in one case never showed up at all! Sunrise sent a text to verify the appointment two days before and Ryan actually showed up earlier but called to make sure it was Ok. He immediately discovered the issues we were having and saw that previous work was done incorrectly causing further problems. He was very friendly and checked the whole system. I was concerned about one sprinkler head but he assured me it was OK and explained how to tell if it needed to be replaced. It was just an overall pleasure to have someone who took the extra time to make sure everything worked as it should instead of rushing do they could get to the next job. Very impressed and extremely happy! Thank you so much! We recently purchased our home in Palm Harbor and had a combination of some wear and tear on our lawn sprinkler system coupled with Irma blowing through and needed help with that. I called Sunrise and they had Michael come out to help us with our system and he was amazing. Extremely competent and super communication skills and personality and he fixed us up in no time at all. We will be calling Sunrise now for all of our maintenance, lighting, etc needs from now on. Thanks Michael. We highly recommend Sunrise Irrigation for all your landscaping needs. Joe is as down to earth as you can be and not only provided us the best pricing (by far) but also you couldn’t ask for a better partner for completing the job. Joe and his team repaired our front irrigation, put in two new zones in the back, a new controller, hooked us up to reclaimed, sodded the front and back, crushed shell front and back, planted 6 cabbage palms, re-did our front landscape garden and much more. This was a big job and Joe took care of any issues that came up. He was always responsive to our needs. When we moved into our house the yard was a detriment, today it is a selling feature!! so happy with the work and the people at Sunrise. Looking forward to working with them on any future needs.